I have new students, fresh to yoga. And some who have tried different yoga classes. I prefer the rank new comers to yoga because it depresses me to see how even after 2 or 3 years with a teacher or style some students don't have the basics right, of a yoga code of conduct or even poses like the fish ,matsyasana ( which is a qualifying pose that way) ). Some of these teachers are teaching celebs and some teachers have super practices. 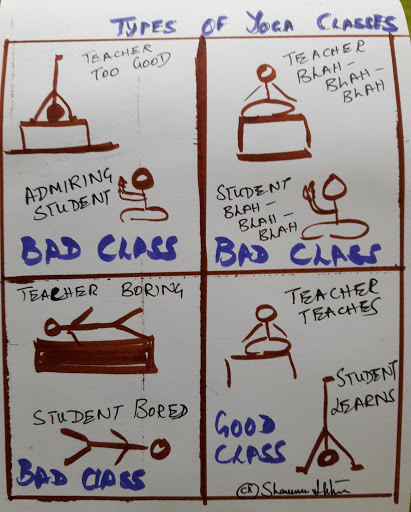 So even while learning yoga myself I have seen how a pracititioner with a super yoga practice can be a lousy teacher. Then there are timid teachers who share more theory than practice. Some teachers who focus on standing / floor poses for the entire class because to teach inversions or arm balances is too demanding. The variations and combinations of teachers and students are exhausting. It used to irritate me how casually yoga was being treated including by big institutions. Often it has become a way in which ashram heads keep rich people / donors happy by making them yoga teachers! It gives bored rich women a halo and it gets the ashrams more bored rich donors seeking salvation. But I have resolved this irritation now ..in my head. I believe u get the yoga teacher u deserve. So if u are in a class where sadhana is not paramount that is your choice, your karma.